"A mystery in the land of kings of the Ancient World"
I love the witty title as we explore the Ancient World in this series called the Athenian Mysteries. In the sixth book we meet THE SINGER FROM MEMPHIS. Of course, those were turbulent times of outrages, wars and insults among the Egyptians, Persians and Athenians. At this time, Memphis is the capital of Egypt, ruled by Persia which is locked in strife with Athens. Herodotus, the first Historian, arrives in Memphis to research his great book in 450BC. The city is preparing for war. Today we might call Herodotus a war reporter. He has engaged a professional informer called Nicolaos in Athens as his security and guide. The suspicious Nicolaos has to bring his wife Diotima, who loves ancient philosophy, risky as it seems. Before they even arrive in Egypt Nico has to save Herodotus from professional assassin Markos, who tries to shoot them in a harbor on the isle of Thera. Then it's a nail-biting attempt at piracy on the Aegean. Djanet is a singer from Memphis who will be Nico's contact, as he tries to bring about a peaceful rebellion by finding the lost symbols of the pharaoh; a crook and flail which will make the people accept a new leader, Inaros. But Markos follows Nico and at Memphis he runs into Barzanes, a man who reports to the Great King of Persia. All this and he's not even sure if the sweet-voiced tavern singer he's spotted is Djanet. The corrupt civil servants have an interest in not allowing a change of leadership. Meanwhile Diotima and Herodotus are enjoying the time of their lives visiting temples, studying inscriptions and interrogating the locals. More than one suspicious death follows their inquiries. With superstitious Egyptians, stylish Persians and snobby Athenians, heat, dust and crocodiles, not to mention loaded Eastern crossbows, this richly filled treat will be enjoyed by historical mystery readers. The tone is light but we are never in doubt about the deadliness of the dangers. Even the plague of bedbugs. The more I read the more I loved the adventure. Getting on board with Herodotus was sheer genius. Gary Corby thanks Herodotus for putting his inquiries on paper, and leaving us this fascinating trail of cross-purposes for his characters. 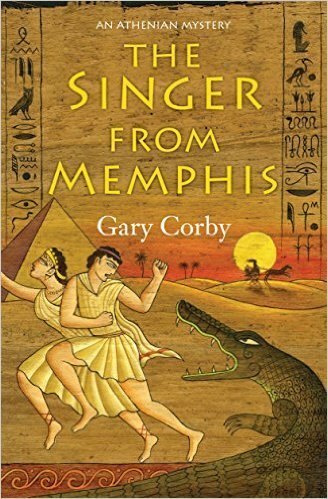 THE SINGER FROM MEMPHIS could never be king - but could she be a pharaoh? You'll have to read it and find out for yourself. A historical murder mystery adventure that stretches from Classical Athens to Egypt in the footsteps of the first historian, Herodotus! Nicolaos, the only private investigator in ancient Athens, discovers that helping an author with his book research can be very dangerous. The would-be author Herodotus has hired Nico and his priestess wife, Diotima, to accompany him to Egypt to research that ancient country�s history. Unfortunately, Egypt happens to be in the throes of a rebellion against the Persian Empire. Pirates infest the sea route. Three different armies roam the Egyptian countryside. The river is full of crocodiles. Everywhere Nico turns, there�s a secret agent ready to kill him, and he can�t find a decent cup of wine anywhere. A simple historical investigation turns into a dangerous adventure of international espionage.